The Prime Minister invited the social partners and non-governmental organizations to submit proposals for solving the public finance deficit and the problem related to introducing the two-pillar pension system in Slovakia in 2005, which resulted in negative impact on public finance, mainly on savings of the Pillar II participants. The loss of the Pillar II funds represents an amount of EUR 600 million against inflation. It is loss amounting to 11.98%. Such results have evidenced that all negative aspects, having been known since 2000, shall cause the loss of 20% - 40%, as it was in Chile and Great Britain. A conservative model for the assets appreciation of 2% above inflation and models of the Ministry of Labour, Social Affairs and Family and OECD of 3% of assets above inflation. Then the funds loss of the Pillar II amounted to 30 to 33%. The development of real assets returns from the Pillar II is described below. HONORS a.s. has been dealing with the issue of social system in Slovakia since 1999, therefore the company accepted the Prime Minister appeal and on 7 June 2012 submitted the proposal for solving the pension system problem, including solutions for the public finance deficit. The solution arises out proposal of 2001 discussed in the Slovak Republic Government on 7 August 2002, No. UV-5450/2002. Annex includes complete documentation "Proposal for solving problems of the current pension insurance and for related problems of social system" with "Covering Letter adressed to the Prime Minister". 2. 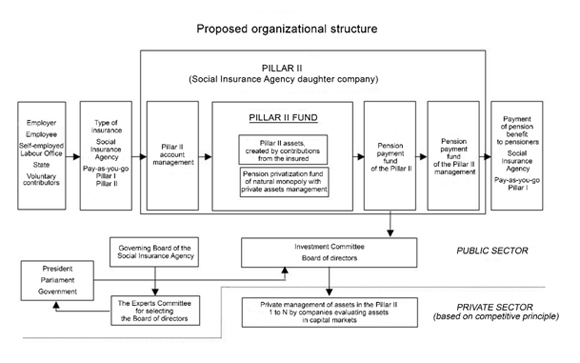 To introduce balanced solidarity and merit principle to the pension insurance system, in accordance with the ILO recommendations, with the contributions of 3:1 at the entry and 2:1 at the output, having to minimize expenditures for securing the system, and thus ensure the economy competitiveness in the Slovak Republic. To provide financial sources to the social system from contributions and eliminate, or minimize, income from general tax. 3. To harmonize the Pillar I and II with the Constitution of the SR and ensure that with the same amount having been contributed into the system the people are guaranteed the same pension benefit. The public finance principle implies that there is no market with the accounts management. 4. Upon introducing competitiveness in the assets management in the Pillar II system the returns shall increase, with anticipated appreciation of 2-3% per annum. 5. By allocating the functions between public finance and private sector the state can offer guarantees to people in the same way as it is in the Pillar I. 6. Establishing the intergeneration solidarity fund as part of the Social Insurance Agency shall solve the problem of the Social Insurance Agency liquidity. 9. Upon solving solidarity, the period of contributing into the system can be set to 37 years, which creates freedom of decision-making while deciding when to retire, unless the person had contributed actively into the social insurance system for the period of 37 years and his or her pension is 1.2 times the subsistence minimum of the individual life expectancy. 10. The number of years of contributing into the system is reasonable to connect to the medium life expectancy.